Hot weather is almost upon us and what is better to cool you off than ice cream? Cayuga County has at least 100 ice cream stands but I am only going to tell you about five. 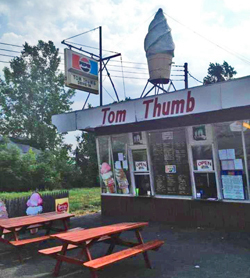 Explore any small village in the Finger Lakes Region and there always is an ice cream stand or two. Reese’s, out on Routes 5 & 20 West, has some of the best Orange Sherbet/Vanilla Swirl I have ever tasted and, in fact, I have never had any other flavor at Reese’s. I know there are others flavors plus sundaes, hot dogs and other treats, but that flavor just hits me right. Big cones loaded with taste. The parking lot is always full so they must be doing something right. Pete’s Treats, Rte. 90, Union Springs, is a cute walk-up window place next door to The Produce Place. Again, a great selection of flavors, great service and other options beyond ice cream. Ed & Jean’s Ice Cream Stand, Port Byron, will not disappoint you either with a great selection of flavors. Stop on your back from Fair Haven and a day at the state park on Lake Ontario and you will not go home hungry. Tom Thumb on Rte. 38A, Owasco, offers ice cream; Hoffman hot dogs and Coneys, a real Central New York tradition; onion rings and other “food” ranges plus a fabulous view of Owasco Lake. Soft and hard ice cream, frozen yogurt, sugar free options and 30 or more flavors to choose from will all confuse and delight you. Cream at the Top, Rte. 34b, King Ferry, is really the cream of the crop! Open from 3 – 9 pm usually, it offers more than 40 flavors of delectable ice cream and there are sure to be a few which will tempt you. There are plenty of picnic tables where you can sit and enjoy a breeze and whatever flavor tickles your fancy. My favs are Cinnamon and Green Tea and while I cannot always get it here, it is usually on the menu. Look for the mascot - cow holding an ice cream cone - perched on top of the stand. New at Cream at the Top for 2013 are some mouthwatering sections. “Queen of Hearts” features dark chocolate ice cream with raspberry swirls and fudge filled hearts while “Appalachian Trail” offers lush banana ice cream with honey crunch cashews and chocolate flakes. “Oh my, Cherry Pie” is vanilla ice-cream with cherries and graham cracker swirls. Sort of a cherry pie a la mode in a cone! And finally, there is “It’s Movie Time!” with popcorn flavored ice cream and sea salt caramel swirls and caramel truffles. A small cone is big - so plan ahead. Your eyes may be bigger than your stomach. So start screaming because Cayuga County certainly has ice cream for you!